A genuine offshore cruising yacht in excellent condition. 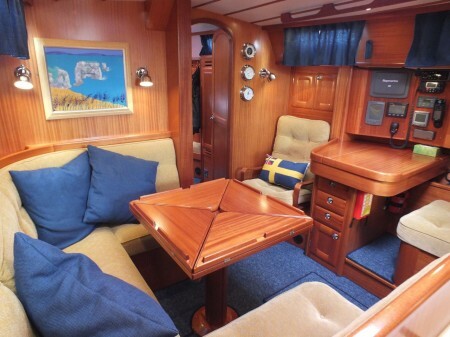 Annika has the optional CLASSIC transom with extra aft deck space and huge storage locker. She has two aft cabins and a large cabin forward, spacious saloon and generous galley. She is very well equipped for cruising and has been very well cared for. Her specification includes bimini, cruising chute, storm jib, staysail, wind generator and a full electronics package. Recent upgrades include new chart plotter, AIS, new sails.